Gareth Bale needs to buckle down and concentrate on his football to prove his Real Madrid doubters wrong, says striking great Andriy Shevchenko. Shevchenko, 38, retired in 2012 but remains Ukraine's record scorer with 48 goals, and won the Champions League and Ballon d'Or while at AC Milan. 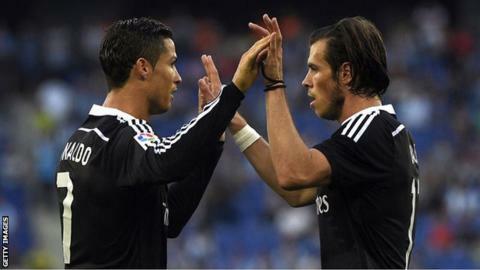 Wales forward Bale has had a turbulent second season with Real after joining them for a world record £85m in 2013. "I think he just has to be quiet and find his best form," Shevchenko said. "He is a great player and if he decides to stay there, if he loves Real Madrid, then he should be quiet and focusing on his game. "It's all about him, what he wants to do; if he decides to move it's all his decision." Shevchenko scored 127 goals for Milan in 208 league games and was a record buy for an English club when he joined Chelsea for £30m in 2006. But he never recreated his scoring touch at Stamford Bridge, with just nine goals from 48 league games, and was loaned back to Milan before leaving for former club Dynamo Kyiv. Bale scored 23 goals in 43 appearances for Real in his first season, yet despite almost matching that with 21 in 53 this campaign has been jeered by fans and criticised for his performances by the Spanish press. That saw the 25-year-old's agent, Jonathan Barnett, claim that Bale's team-mates did not pass to him enough - an outburst that was criticised by Real manager Carlo Ancelotti. Ancelotti is under pressure himself after his side were pipped to the Spanish title by Barcelona and beaten in the Champions League semi-finals by Juventus. Bale has been linked with a move to Manchester United as part of a deal that would see goalkeeper David de Gea head the other way.